That’s the slogan that everyone, or most people, think of when they think of Midas auto repair shops. 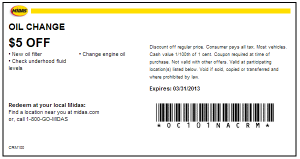 I usually think of Midas for their cheap oil changes since they are the place I usually go to get mine taken care of. Midas specializes in brakes, so you might want them to check out your brake pads and the rest of your system when they change your oil.